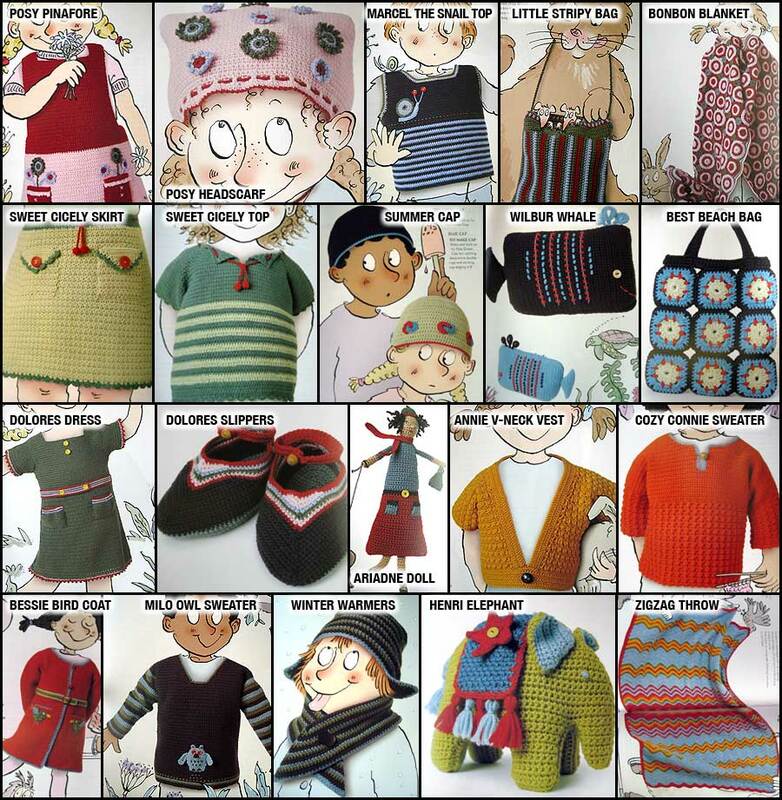 A fabulous, must-have collection for all who love to crochet for kids, each of the 20 projects is accompanied by concise directions and color illustrations. The designs emphasize brilliant color and fun-filled styling, and the patterns are grouped by season, with designs for tops, dresses, jackets, scarves, hats, blankets, and even toy animals. Children will love to wear and play with the crocheted items from this vibrant collection. POSY PINAFORE: Rowan 4-ply Soft - 3 (4, 4) of color #395 Fairy / 2 (2, 2) of color #374 Honk / 1 (1, 1) of color #367 Leafy / 1 (1, 1) of color #370 Whisper - to fit ages 2-3 (3-4, 5-6) / finished chest 26¾ (29, 31)"
POSY HEADSCARF: Rowan 4-ply Soft - 1 ball each of colors #395 Fairy, #374 Honk, #367 Leafy and #370 Whisper - to fit ages 2-3 (3-4, 5-6) / finished width at widest 12 (12½, 13)"
MARCEL THE SNAIL TOP: Rowan 4-ply Soft - 2 (2, 3) of color #372 Sooty / 1 (2, 2) of color #370 Whisper / 1 (1, 1) of color #367 Leafy / 1 (1, 1) of color #393 Linseed - to fit ages 2-3 (3-4, 5-6) / finished chest 26¾ (29, 31)"
SWEET CICELY SKIRT: Rowan 4-ply Cotton - 3 (4, 4) of color #131 Fresh / 1 (1, 1) of color #135 Fennel AND Rowan Cotton Glace 1 (1, 1) of color #741 Poppy to fit ages 2-3 (3-4, 4-5) / length to waist 10¼ (12¼, 14¼)"
SWEET CICELY TOP: Rowan 4-ply Cotton - 2 (3, 3) of color #135 Fennel / 1 (1, 1) of color #131 Fresh AND Rowan Cotton Glace 1 (1, 1) of color #741 Poppy to fit ages 2-3 (3-4, 4-5) / finished chest 27 (29½, 31½)"
WILBUR WHALE (Blue Whale): Rowan 4-ply Cotton - 1 of color #150 Navy / 1 of color #129 Aegean AND Rowan Cotton Glace small amount of color #741 Poppy - finished measurements 8¾" x 4½"
(Turquoise Whale): Rowan 4-ply Cotton - 1 of color #129 Aegean / 1 of color #150 Navy AND Rowan Cotton Glace small amount of color #741 Poppy - finished measurements 8¾" x 4½"
BEST BEACH BAG: Rowan 4-ply Cotton - 1 of color #131 Fresh / 1 of color #129 Aegean / 1 of color #150 Navy AND Rowan Cotton Glace 1 of color #741 Poppy - finished measurements 6 " x 6½"
DOLORES DRESS: Rowan 4-ply Soft - 7 (7, 8) of color #367 Leafy / 1 (1, 1) of color #374 Honk / 1 (1, 1) of color #395 Fairy / 1 (1, 1) of color #370 Whisper - to fit ages 2-3 (3-4, 5-6) / finished chest 26 (28¾, 31)"
DOLORES SLIPPERS: Rowan 4-ply Soft - 1 ball each of color #391 Folly AND #372 Sooty AND small amounts of color #367 Leafy, #374 Honk, #395 Fairy, #370 Whisper - to fit ages 2-3 (3-4, 5-6) / length of slippers 5¾ (6¼, 6¾)"
ANNIE V-NECK VEST: Rowan Pure Wool DK - 4 (4, 5) of color #033 Honey - to fit ages 2-3 (3-4, 5-6) / finished chest 26 (28, 30)" & length to shoulder 11½ (12¾, 13¾)"
COZY CONNIE SWEATER: Rowan Pure Wool DK - 6 (7, 8) of color #040 Tangerine AND 1 (1, 1) of color #003 Pier - to fit ages 2-3 (3-4, 5-6) / finished chest 26 (28, 30)" & length to shoulder 14½ (15½, 16)" & sleeve length 6½ (7½, 9)"
BESSIE BIRD COAT: Rowan Pure Wool DK - 8 (9, 10) of color #036 Kiss / 1 (2, 2) of color #003 Pier / 1 (1, 1) of color #020 Parsley / 1 (1, 1) of color #032 Gilt - to fit ages 2-3 (3-4, 5-6) / finished chest 24¾ (26¾, 28¾)" & length to shoulder 19 (21¾, 24½)" & sleeve length 8½ (10, 11)"
MILO OWL SWEATER: Rowan Pure Wool DK - 6 (7, 8) of color #003 Anthracite / 1 (2, 2) of color #020 Parsley / 1 (1, 1) of color #006 Pier- to fit ages 2-3 (3-4, 5-6) / finished chest 29 (31, 33)" & length to shoulder 14½ (15¼, 16)" & sleeve length 8¼ (10¼, 11½)"
WINTER WARMERS (Girl's - not pictured): Rowan Pure Wool DK - 2 (2, 2) of color #036 Kiss / 1 (1, 1) of color #020 Parsley / 1 (1, 1) of color #006 Pier- to fit ages 2-3 (3-4, 5-6) / hat circumference 17½ (18, 19)" / scarf size: 6" x 27½"
(Boy's): Rowan Pure Wool DK - 1 (1, 1) of color #003 Anthracite / 1 (1, 1) of color #020 Parsley / 1 (1, 1) of color #006 Pier- to fit ages 2-3 (3-4, 5-6) / hat circumference 17½ (18, 19)" / scarf size: 6" x 27½"